I’m a recent immigrant to Hong Kong. Since I came here, I had been living in an over 110-suqare-foot rental house. I felt very much depressed in my life. My husband and my son were unwilling to come here to live with me. At that time, to have a house of my own in Hong Kong and live together with my family here—such was my greatest dream. For the purpose of having a sure dwelling, I worked for eleven hours every day, without fear of hardships or exhaustion, and even never bearing to give myself a day off. I believed beautiful home was built by my own hands, so I strived for my dream all along. In early 2016, in an inland hospital my husband was diagnosed with severe diabetes and tuberculosis with complications of lung atrophy, as well as some other illnesses. In the condition of abnormally high blood sugar, the doctor still carried out a minor operation on my husband. At that time, we didn’t know anything about medical knowledge, so we were not aware that if man becomes diabetic, his wound will more difficultly close up than that of a normal one. As a result, after operation, my husband’s wound had been inflamed all the time. Later, he wasn’t healed until he was sent to another hospital to be cured for more than ten days. Faced with two previous hospital bills and the cost of a long-term treatment later, I could not breathe from the pressure. As my husband’s illness required to be taken care of, I had to take four days off every month, so as to come back to inland China to look after him and take him to see doctors everywhere. Soon, two months passed by. My husband was no better, but rather grew worse. Gradually, he lost faith in his treatment, and refused to go to hospital. Moreover, he became more and more hot-tempered. When something did not accord with his will, he would hurl abuse offensive to hear at others, so my son and his wife were unwilling to look after my husband. Once, my husband’s illness was aggravated again. Seeing his pained expression, I advised him to have a treatment in hospital. However, he scolded me, “I will not go! Death is nothing. It’s none of your business if I die. Go back to Hong Kong!” At that moment, I held back my tears, having a stomach full of grievances. I thought: I am saying that for your own good. Not only do I work hard to make money every day, but I also need to look after you and accompany you to see doctors during my holiday. But I just get your abuses in return every day. Why am I bothering? I really wanted to retort upon him then. But I knew his obstinacy, and was afraid that he would sell our house in inland China in a moment of anger. In that case, my son and his wife would have no place to live in. Sad and angry, I hated him so much that I wanted him to die quickly. Yet, I feared that I would be lonely after he was gone. In order to live peacefully, I had to keep my anger under control. Afterward, I turned to try traditional Chinese medicine and searched around for a good traditional Chinese doctor. I would take my husband to where I heard there was a good doctor. All the same, his illness didn’t get better after a period of time. What’s worse, his weight went down from over 50 kilos to over 40. In the midst of this agony, I was physically and mentally exhausted, and helpless in heart. I didn’t know how to walk the path ahead of me. I was lost. … I had never believed in superstitions before, like Fengshui, worshiping Buddha. However, due to my husband’s condition worsened continuously, after my relatives’ persuasion I began to attempt to worship Buddha for the healing of my husband’s sickness. I went to worship Buddha everywhere as my elders said, but it didn’t work. As time went by, my husband’s illness got worse. At the end of May of that same year, my colleague accompanied by a sister to spread the gospel to me. The sister told me a lot, such as God’s creating the heavens and earth and all things with the word, God’s controlling all things and humankind with His mind, and so on. I thought what she had said was very good, and I had never heard it before. Moreover, all things said by her really existed in the real life. Meanwhile, I also felt this God has authority and has power. Because I had tried a lot of methods for my husband’s illness, but they didn’t work, I embraced an attitude of “try and see” when I accepted the gospel. I openly told the sister my difficulties. Then she prayed for me and my husband, “O God! I’m willing to commit the difficulties of sister A’en and her husband’s illness to You. May You care for and protect them. …” Her action warmed my heart. She also said to me, “Mankind and all things were created by God. God cares for us and cherishes us like our parents. We may pour our difficulties out to God. We also may pray to God, commit everything to Him, and ask Him to arrange it for us. …” In the following month, every few days, sisters brought food and soup to me after my work, and moreover, sang hymns to praise God and fellowshiped about God’s words with me. I felt the concern and care I had never experienced before, which touched my heart very much. And I truly tasted God’s love. In this way, I realized that I began to like listening to songs of God’s words and reading God’s words, as well as having contact with my sisters. In early July, my husband came to Hong Kong. One afternoon, we went to our mother’s home for dinner. When we went downstairs, my husband suddenly leaned on the wall, with his face livid; he was in a cold sweat all over and out of breath. At that time, I was flustered by this scene. Influenced by the traditional idea “Man cannot die in a strange land; falling leaves return to their roots,” I was afraid that he would die in Hong Kong. Besides, as my husband didn’t have a Hong Kong ID card, the fee of his medical treatments in Hong Kong would be excessive dear. Therefore, I prayed to God unceasingly, asking Him to protect my husband. At the same time, I called my son in inland China to come to Hong Kong quickly and take his father back to receive the treatment in inland hospital. Then we went downstairs to call a taxi, but it took us two hours to cover the dozens of meters from the downstairs to the roadside. After arranging for my husband at our mother’ home, I went to the work place to quit my job, and asked my friend to help me buy a wheelchair. At the meantime, my young brother also chartered a car in Shenzhen for my son to take his father back. However, when my son came over, it was already midnight, so the three of us had to stay overnight in Hong Kong, waiting until the second day to return to inland China. In the meanwhile I prayed to God unceasingly for protecting my husband from getting into trouble. With praying to God constantly, my heart calmed down gradually. I remembered a paragraph of God’s word, “Since the Creator has determined a fixed set of circumstances for a person’s birth, it goes without saying that He has also arranged a fixed set of circumstances for one’s death. In other words, no one is born by chance, no one’s death is unexpected, and both birth and death are necessarily connected with one’s previous and present lives. The circumstances of one’s birth and death are both predetermined by the Creator; this is a person’s destiny, a person’s fate” (“God Himself, the Unique III”). Through God’s words, I understood that where we were born or where we will die is not controlled and chosen by ourselves, but predestined and arranged long in advance by God. Because this is the law of nature laid out for us by God, the foreordination of everyone. Thinking of this, my heart settled considerably. Then I prayed to God silently, “O God! No matter how my husband’s disease progresses, it has been preordained and arranged by You. No one can change this fact. I commit him to You, letting You arrange for him. If he passes away tonight, I also will obey Your arrangement.” At that night, I slept very quietly and securely. The next day, we set out after breakfast. It took us three hours to come back to our city finally by car. I originally wanted to send my husband to hospital directly, but he insisted on going back home. I agreed with him, because although I was concerned about his illness, yet I knew no one could force him when he lost his temper. Furthermore, God’s words also made me understand that man’s birth and death are in God’s hands. No matter what happened, that was his destiny. I was willing to obey God’s sovereignty, and commit all things to Him and let Him arrange for us. The following morning my husband voluntarily said he wanted to go to hospital. Hearing this, I felt very happy. I believed it was out of God’s orchestration, so I thanked God continuously in my heart. Because my husband’s condition was serious, he was arranged to live into the ICU. For three days, my husband had a fever over and over again, with many tubes and instruments inserting in his whole body, suffering from the incontinence. During that time, I took care of him 24 hours a day, changed the dirty sheets and quilts for him constantly, and made him drinks, without having a sound sleep. However, although I had been very tired and busy these three days, I didn’t complain as before, for God’s words gave me the power. A hymn of God’s word accompanied me all along, “Of everything that occurs in the universe, there is nothing that God does not have the final say in. What exists that is not in God’s hands? All that God says goes, and among men, who is there who can change God’s mind? Nothing can hinder God’s plan, can hinder God’s plan. God is ever-present in His work as well as in the plan of His management. What man can interfere? What man can interfere? Is it not God who has personally made these arrangements? Entering into this situation today, it still does not stray from God’s plan or what God foresaw; it was all determined by God long ago. Who among you can fathom God’s plan for this step? Who can fathom God’s plan for this step? 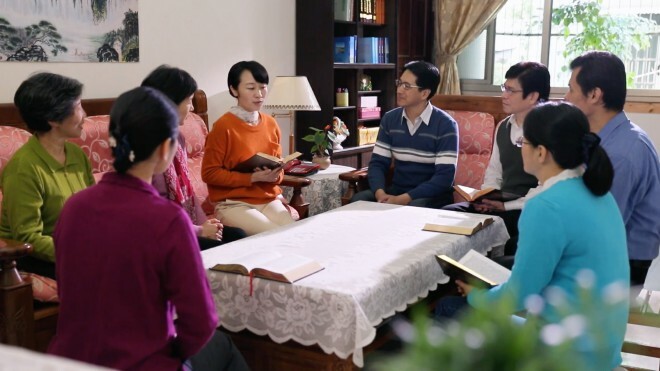 God’s people will listen to God’s voice, God’s people will listen to God’s voice, and each and every one of those who truly love God shall return before God’s throne, return before God’s throne, return before God’s throne” (“The First Utterance” of God’s Utterances to the Entire Universe). I trusted every word of God, and I was convinced that God has the final say in everything that occurs in the universe. My husband suffered from the disease and needed my care, which was the necessary progress that must be experienced in my life. I didn’t complain, and should fulfill my duty as a wife. As for when my husband would mend nicely, it was determined by God. I was willing to obey God’s arrangement. From God’s words, I had strength unknowingly and my heart was relaxed and free. No matter how exhausted I was in taking care of my husband, I didn’t have the slightest complaint any more. Presently, my husband was diagnosed with an infectious disease, so he was transferred to the department of infectious diseases. In the following 20 days, I still didn’t leave the hospital, and God’s words accompanied and encouraged me every day. I read the passage of God’s word, “God Himself, the Unique III” on my cellphone. These words tell about the six junctures in a human life, the mysteries in each juncture, and the fact of how God rules over everything. In addition, I also listened to many hymns of God’s word, feeling especially peaceful in my heart. Little by little, my husband’s condition improved some. Nevertheless, because of a long time in hospital, he had more and more temper. Once anything unpleasant befell him, he would scold. And every day he shouted that he wanted to come out of the hospital. In that moment, I was worried that his emotion would disturb others, and that others would blame us. After all, there were other patients needing rest in the ward. Yet, I couldn’t persuade him to stop scolding at all. When he lost his temper, I could only pray to God silently, “O God! May You quiet my husband’s heart. Don’t allow him to scold, so as not to disturb other patients. …” After my prayer, my husband really calmed down each time. Sometimes, the relatives of other patients in our ward, or the doctors and the nurses also advised him, “Your wife is really so good. You can stop scolding her.…” I was certain that it was God’s wonderful deed, and that He heard my prayers and changed all people, matters and things. So I was even sure of the fact that Almighty God is the only true God, and I also had faith in God’s authority. It is just like a passage of God’s words a sister read me later, “The heart and spirit of man are held in the hand of God, and all the life of man is beheld in the eyes of God. Regardless of whether or not you believe this, any and all things, living or dead, will shift, change, renew, and disappear according to God’s thoughts. This is how God rules over all things” (“God Is the Source of Man’s Life”). During the time when my husband was ill, God arranged all of these for me meticulously. It was God who changed me from an unbeliever to a believer in God, from feeling His existence to deeply appreciating that He looks into my heart beside me and that leads every day of my life. And He also made me gradually be certain that Almighty God is the only true God and realize that everything He did was to save me. As I looked back, I realized that I was so arrogant, conceited, poor, and pitiful. I always believed that beautiful home was built by my own hands, so I strived to earn money all the time under my own steam. However, I was still penniless at last. After experiencing these things, I understood that in our life how much food we enjoy, how many things we use, how much wealth we own—these all are neither controlled by ourselves, nor gained by our own ability. It is God who dictates and arranges all these things. As the saying goes, “You will have it if it belongs to you, whereas you don’t kvetch for it if it doesn’t appear in your life.” After my husband left hospital, I no longer was merely concerned about my work every day; instead, I just worked for four days a week. In such a way, I had more time to see after my husband, and to stay with my brothers and sisters to attend meetings, learn and sing hymns, read God words and watch gospel videos. Because of attending more meetings and reading more God’s words, I had more knowledge of God. Now, my husband has immigrated to Hong Kong, and his condition has gotten better, with his weight increasing to 60 kilos from over 40 kilos. As his condition has gotten better, his mood also has lifted, so our life runs smoothly. I deeply knew that all of these are brought by God, which couldn’t be achieved by my own effort. Looking back upon the road I had walked, I knew it was God’s words that awoken my heart and spirit and made me abandon the wrong views of pursuit of the past so that I no longer feel perplexed but feel enriched and released in my heart, finding a goal and direction in my life. Thank Almighty God for choosing me. Having the opportunity to know the Creator is the greatest blessing in my life. As Catholics, understanding the meaning of names of God in different ages is critical for us welcoming the return of the Lord. Once saved, always saved? Can those who sin every day enter the kingdom of heaven? Christians should put aside those notions and understand the true meaning of salvation. Is Eastern Lightning the return of the Lord Jesus? Why do the pastor condemn it? Let’s see how he saw through Satan’s rumors and became certain of God. Why do we still sin? That’s because we haven’t found the root of our sinfulness. He, a Catholic, is no longer troubled by being unable to get rid of sin.